Alan's Factory Outlet Vinyl Gazebo Kits are shipped nationwide in the USA. The vinyl gazebo kits come in octagon or oval shapes. Also, gazebo kits are available with a single or double roof in many different sizes. Vinyl Gazebo kits are precut and bundled into sections for easy assembly. 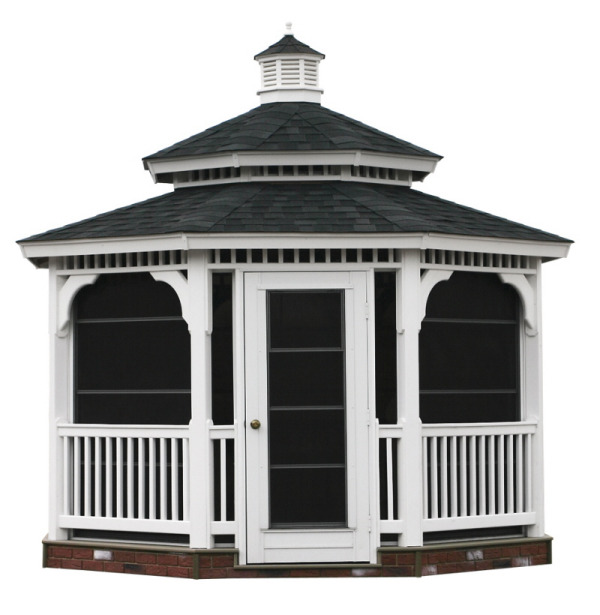 Hardware and step-by-step instructions are included with all of our vinyl gazebo kits. 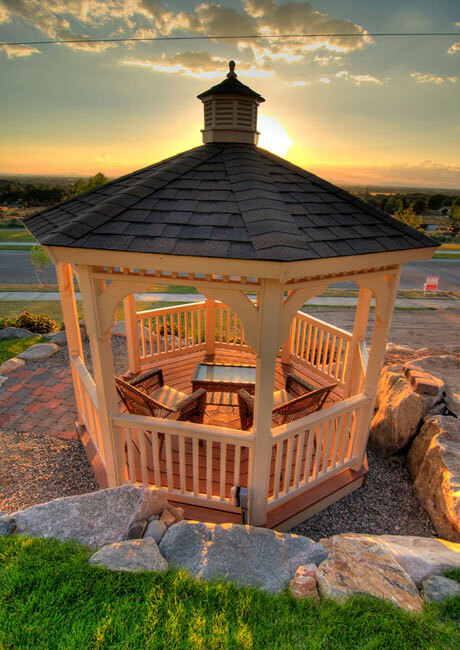 An owner has the opportunity to enjoy a gazebo that he or she assembled! Free delivery on the vinyl gazebo kits to VA and WV. 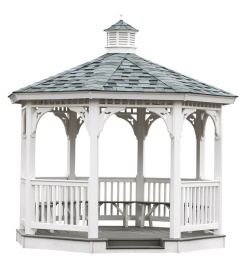 Vinyl Gazebo kits come with 30 Year Shingles in the color you want. Optional Screens are available with vinyl gazebo kits. We offer various color options to our customers because we know that every gazebo owner has different tastes. For instance, some gazebo owners want the roof of their gazebo to match the roof of their home. Alternatively, other gazebo owners have a particular color that they favor. They have a color scheme for the garden area or yard that includes the appearance of their gazebo. Regardless, of a customer’s preferences, we have plenty of options to satisfy the creative needs of our shoppers! Vinyl Gazebo kits come with a Rhino Decking Floor. Floorless Gazebos are available. 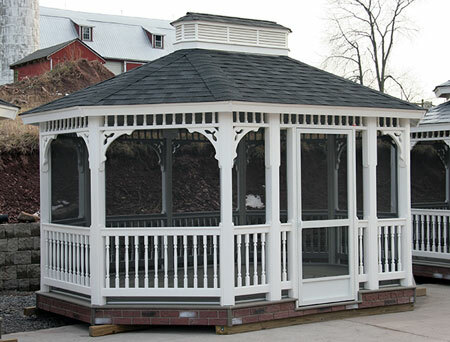 All Octagon and Oval Vinyl Gazebos come with a Cupola. There are a number of reasons why people purchase our vinyl gazebo kits. For example, some of our customers want a gazebo to put in their garden. They envision themselves relaxing in the gazebo admiring their collection of fragrant flowers. Other customers enjoy having one of our gazebos near their swimming pool or pond. Owners would be able to watch family and friends swim from the shade of their gazebo. People who own horse farms appreciate our vinyl gazebo kits. A gazebo is the perfect place to sit and watch young children ride their horses around a ring. Vinyl gazebo kits are ideal for people who love to bird-watch or observe the activities of the wildlife on their property. A gazebo adds to the enjoyment of many activities. People who purchase our vinyl gazebo kits quickly discover the many benefits of owning a gazebo. First, our attractive gazebos add to the appearance of a piece of property. 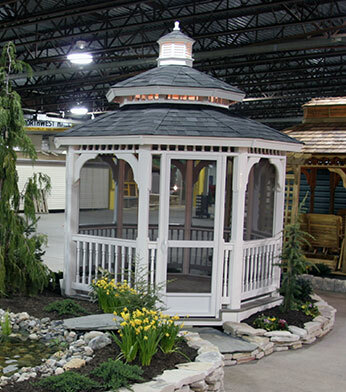 The design of our gazebos lends a classic touch of elegance to a backyard or garden area. Our gazebos serve both a practical and a decorative purpose for our customers. Another benefit of purchasing one of our vinyl gazebo kits is that it is a feature that can help to sell a home. People touring a home for sale will admire a beautiful gazebo on the property. Our well-designed, durable gazebos are impressive to see. Certainly, a gazebo is an attractive selling point for a house that is on the market. Gazebo kits are delivered by tractor trailer curbside. It is the responsibility of our customers to unload their vinyl gazebo kits. We recommend having a 2nd person to help you unload the gazebo. A 2nd person is also helpful in the assembly process. Two pairs of eyes are effective at making sure that all of the assembly instructions are being followed. Gazebos are also available fully assembled. Wood Pergola Kits and vinyl gazebo kits are delivered for free to Virginia and West Virginia. On the 16', 18' and 20' gazebo kits the floor is not precut.